Transient ischemic attacks (TIAs) typically present with easily recognizable neurological focal deficits. Symptoms such as paroxysmal involuntary movements are not usually considered to be a manifestation of TIA. We report a case with video documentation of TIA due to permanent atrial flutter presenting as acute left hemichorea. To our knowledge, such a case has not yet been reported. The present case constitutes a crucial diagnostic challenge in neurological practice in order to prevent a high risk of subsequent ischemic stroke. 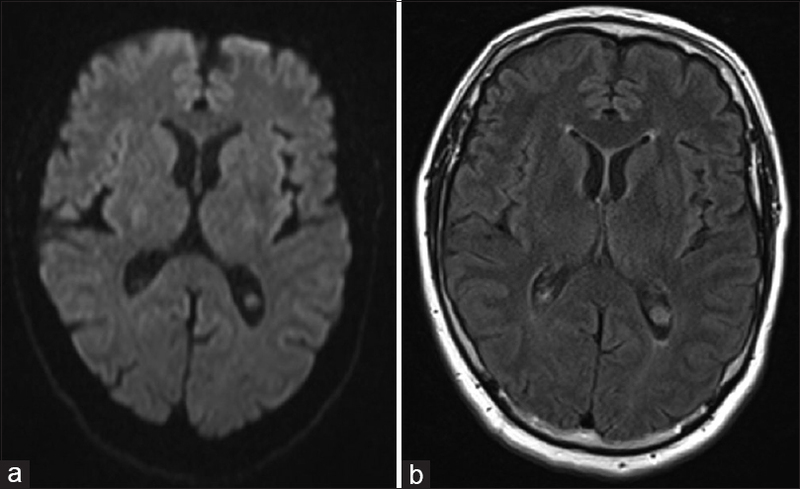 Transient ischemic attacks (TIAs) are acute episodes of temporary neurologic dysfunction that typically last <1 h, and usually present with easily recognizable neurological focal signs such as unilateral motor weakness, speech, or visual disturbance. Symptoms such as paroxysmal involuntary movements are not usually considered to be in relation with a TIA, and could delay the diagnosis. Chorea is an abrupt, non-rhythmic, and unpredictable involuntary abnormal movement. Post-stroke hemichorea is an uncommon involuntary hyperkinetic disorder and is most often produced by lenticular lesions, followed by subthalamic and cortical lesions. In the same way, acute hemiballism or hemichorea are extremely uncommon presentations of TIA and mostly occur in cases of arterial stenosis involving the contralateral carotid or middle cerebral artery (MCA).,, Atrial fibrillation (AF) is highly prevalent in TIA patients (up to 18.6%) and needs an appropriate treatment. We report a case with video documentation of acute left hemichorea revealing atrial flutter. To our knowledge, such case has not yet been reported. A 73-year-old man with a past medical history of hypertension, tobacco, and alcohol abuse was referred for acute onset of left hemibody involuntary movements. Examination showed abnormal brief, abrupt, irregular, non-stereotyped, and unpredictable movements involving the left hemibody and worsening with mental activity consistent with left hemichorea associated with myoclonic jerks especially seen on the left hand. These movements lasted for 5 h and spontaneously resolved [Video 1]. The patient presented no alteration of consciousness during this episode. He had no known blood pressure fluctuations and the onset of chorea was not precipitated by changes in posture. Brain magnetic resonance imaging (MRI) with diffusion-weighted imaging (DWI) and fluid-attenuated inversion recovery sequences performed 2 h after choreic movement cessation was unremarkable [Figure 1]. Another MRI at 3 T with DWI sequence done at 72 h when patient was asymptomatic was also normal. No extracranial or intracranial arterial stenosis was found on the computed tomography of the supra-aortic trunks. Complete biological assessment including level of antiphospholipid antibodies was normal. Cardiac monitoring in the stroke unit followed by repetitive 24-h Holter monitoring revealed permanent atrial flutter. An electroencephalogram performed during symptoms showed no epileptic activity. The patient was treated with a direct oral anticoagulant without symptoms recurrence. Paroxysmal hemichorea or hemiballism resulting from TIA is very uncommon and rarely reported in the literature. Most of the time, they are a consequence of contralateral MCA or carotid stenosis.,, Hemichorea has already been reported as a transient ischemic phenomenon in a patient with Moyamoya disease, wherein symptoms were induced by hyperventilation. In the same way, limb-shaking (LS) is a well-known condition consisting in brief involuntary hyperkinetic movements involving unilaterally arm-hand alone or arm-hand and leg together and is usually due to transient cerebral ischemia resulting from contralateral major carotid atheromatous disease. Whereas LS often consists of irregular brief jerking, it may be a form of asterixis. In our case, abnormal movements presented by our patient were not consistent with LS. Moreover, the absence of identifiable precipitating factors (e.g., standing up, exercising, coughing, laughing, and blood pressure fluctuations) and the absence of contralateral carotid occlusive disease did not support this hypothesis. Compared with ischemic stroke, the association of AF and TIA is less well established. A recent study demonstrates that AF is highly prevalent also in TIA patients (up to 18.6%) with proportions steeply increasing with age. The etiological diagnosis of sudden hyperkinetic movements is a challenging issue because they can be induced by a wide range of neurological events resulting in dysfunction of the circuits connecting the cerebral cortex to the basal ganglia. Differential diagnoses include metabolic and endocrine encephalopathies (hepatic or renal failure, hyponatremia, hypoglycemia, non-hyperketotic hyperglycemia, and dysthyroidism), toxic causes (exposure to heavy metals, stimulants, or some medications such as L-dopa, neuroleptics, selective serotonin reuptake inhibitors, lithium and methotrexate), immune-mediated disorders (e.g., antiphospholipid antibody syndrome, viral, or post-viral encephalitis, Sydenham chorea, celiac disease), paraneoplastic neurological syndromes or inherited disorders (e.g., Huntington disease, benign hereditary chorea, Wilson disease). LS can also be misdiagnosed as focal epilepsy. However, lack of Jacksonian march and the presence of precipitating factors help in differentiating LS from seizures. Brain MRI can also exclude any infective, tumoral, traumatic, or structural lesion involving the basal ganglia which could induce abnormal movements., To our knowledge, paroxysmal hemichorea resulting from TIA caused by permanent atrial flutter has not yet been reported. In conclusion, in cases of acute hemichorea, TIA diagnosis should be considered even in the absence of contralateral carotid or MCA artery stenosis, not to miss another cause of TIA such as an underlying AF that constitutes a crucial diagnostic challenge in neurological practice in order to prevent a delayed diagnosis, which could lead to a high risk of ischemic stroke. Chung SJ, Im JH, Lee MC, Kim JS, Hemichorea after stroke: Clinical-radiological correlation. J Neurol 2004;251:725-9. Gasca-Salas C, Lang AE, Paroxysmal hemiballism/hemichorea resulting from transient ischaemic attacks. Mov Disord Clin Pract 2016;3:303-5. Kim JW, Choi SH, Kim WJ, Chun SM. Transient ischemic attacks presenting as hemiballism. Mov Disord 2003;18:1399-1401. Margolin DI, Marsden CD. Episodic dyskinesias and transient cerebral ischemia. Neurology 1982;32:1379-80. Buchwald F, Norrving B, Petersson J. Atrial fibrillation in transient ischemic attack versus ischemic stroke: A Swedish Stroke Register (Riksstroke) study. Stroke 2016;47:2456-61. Spengos K, Tsivgoulis G, Toulas P, Vemmos K, Vassilopoulos D, Spengos M. Hyperventilation-enhanced chorea as a transient ischaemic phenomenon in a patient with Moyamoya disease. Eur Neurol 2004;51:172-5. Baquis GD, Pessin MS, Scott RM, Limb shaking-a carotid TIA. Stroke 1985;16:444-8. Yoon Y, Kim JS. Limb-shaking TIA: An asterixis. Neurology 2013;81:931-2. Carolei A, Modesti PA, Limb-shaking TIA: On the borders of evidence-based medicine. Intern Emerg Med 2017;12:675-7. Tiseo C, Ornello R, Degan D, Notturno F. Limb-shaking: Not an exclusive epileptic origin. Intern Emerg Med 2017;12:705-8.